A documentary film by Alain Mazars. Produced by MOVIE DA. Broadcast by CINE + . Selected at Venice Film Festival LA MOSTRA 2015. There is a mystery surrounding Jacques Tourneur. Where does this belief in the invisible world and the supernatural come from? The director was actually anchored in reality. When Jacques Tourneur said in an interview : "a lot of people live in fear and they don't even know it, maybe we can imagine that behind his apparent serenity, he himself lived in permanent fear and his movies were a way of exorcising it? As well as being a portrait of Jacques Tourneur, this documentary  shot in black and white high definition 4K  is also an investigation into what inspired him, through testimonies of famous people who were passionate about his work -- N.T Binh, Frank Lafond, Joël Farges, Serge Le Péron, Gilles Menegaldo, Pierre Rissient, Philippe Rouyer, Dominique Rabourdin and Bertrand Tavernier, and also the psychoanalyst Roger Dadoun. Why did you decide to call your film JT the Medium (filming the invisible)? 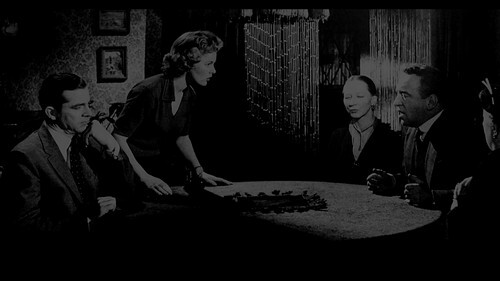 The first image of the documentary shows a seance. It is a film photo (from NIGHT OF THE DEMON). Before directing this movie in England, Jacques Tourneur met a lot of sorcerers and mediums. He was very interested in parallel worlds. One of his last project that he unfortunately did not succeed to realize was about this subject. But when he said he believed in the invisible world, it is not obvious to interpret what he really meant because he had a very rational mind. I think Jung's theory of collective unconscious had a true influence on him. So when he told he believed in invisible world, it's difficult to say what he really referred at because his mind was also very rational. In his films, he proposes a scientific approach of irrational things. This is very obvious about all his most famous films produced by Lewton, linked to fantasy literature and horror movies. But it is also true for all his other films that owns to other types : westerns, thrillers, adventure movies … All his films express something from his subconscious, something which is linked to collective unconscious. JT worked on the way cinema can fascinate the spectator in his subconscious, by stimulating imagination. He did it on a very mysterious, subtle and poetic way, very distinct from traditional fantasy and horror films. Why do you not show any interview of Jacques Tourneur ? There is a mystery about Jacques Tourneur and showing interview clips would have weakened my purpose. The famous psychoanalyst Jung believed that art provides an insight into the unconscious . I think Jacques Tourneur's work is a perfect illustration of this. My wish is to invite the spectator of this documentary to a seance with Jacques Tourneur's fans. During the shooting, I decided to create an atmosphere that might suggest Jacques Tourneur 's ghost could come and visit us, as if it was a true seance. This documentary is not only a portrait of the movie-maker through his work, but also an attempt to suggest the way his films involve us and act on our imagination. This is also a film about his work 's fans. They are invited to play a part in front of the movie camera, the same way as actors would do it. They are the seance mediums. Among the many fans, I chose ten experienced and demanding film enthusiasts. They are distinct from each other : experienced film critics (N.T Binh, Philippe Rouyer), directors who were critics before becoming movie-makers (Bertrand Tavernier, Pierre Rissient, Dominique Rabourdin, Joël Farges, Serge Le Péron), film historians and professors (Frank Lafond, Gilles Menegaldo) and a psychoanalyst (Roger Dadoun). I am grateful to them because they generously accepted to take part in this experiment. They clearly expressed their personal relationship with the movie-maker's work. It is not only a film on Jacques Tourneur but also a film on them. Why is your documentary built from the last films down to the beginning of Jacques Tourneur's work and why did you shoot in black and white ? This documentary is an investigation to the roots of his inspiration. So, it seemed rather logical to start from his last films and finish with his first films and childhood. As most of Jacques Tourneur's films are in black and white, I did not want any breakdown between my "medium's interviews" and the films clips or photos. I like the idea the audience is allowed to watch a documentary with a subjective way. There are a lot of ways to make a documentary film. A documentary can also stimulate the audience imagination.